The rent at Hidden Oaks Apartments ranges from $825 for a one bedroom to a $1,450 three bedroom. Apartments in this building are about 19% less expensive than the Lake Highlands average. This is a pet-friendly apartment. 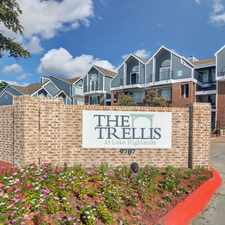 Hidden Oaks Apartments is a nine minute walk from the BLUE DART LIGHT RAIL - BLUE LINE at the LAKE HIGHLANDS STATION stop. This apartment is in the Lake Highlands neighborhood in Dallas. Nearby parks include Wildcat-Ram Stadium, Skyline Park and Fair Oaks Park. Hidden Oaks Apartments has a Walk Score of 29 out of 100. This location is a Car-Dependent neighborhood so most errands require a car. Garden-style charm meets clean, modern design in spacious one, two, and three bedroom apartments at Hidden Oaks Apartments in North Dallas. Our Lake Highlands location positions you close to major employers such as Exxon Mobil and Texas Instruments, as well as to SMU, Richland College, and the diversity of Dallas, Fort Worth, and Arlington. Well-priced floor plans feature stunning design elements including granite countertops, sleek appliances, and roomy walk-in closets. green space at Lake Highlands North Park. Explore how far you can travel by car, bus, bike and foot from Hidden Oaks Apartments. Hidden Oaks Apartments has some transit which means a few nearby public transportation options. View all Lake Highlands apartments on a map. Hidden Oaks Apartments is in the Lake Highlands neighborhood. Lake Highlands is the 60th most walkable neighborhood in Dallas with a neighborhood Walk Score of 45.